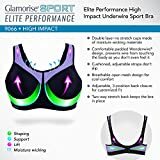 Interested in the Glamorise Women's Plus Size Full Figure High Impact Wonderwire Sports Bra #9066, Black/Purple, 36DD? Is the price too high? You can easily price watch this product and we'll notify you when the price reaches your target.